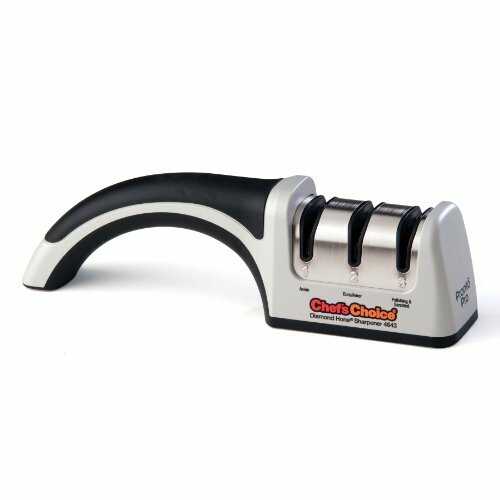 Chef's Choice Pronto Pro Diamond Hone Knife Sharpener No.4643 is a perfect manual sharpener for those who own Asian and European/American style knives and want to quickly and easily apply a superior, shaving sharp edge. Sleek and highly-styled, it's our fastest manual sharpener yet for applying 15 degree edges for Asian style knives and 20 degree edges for European/American style knives. Using precise angle guides, 100-percent diamond abrasive wheels and our acclaimed Crisscross sharpening technology, it provides a super sharp, durable, arch shaped edge with lots of "bite." The secret is in the 100-percent diamond abrasive wheels which sharpen simultaneously "into" and "out-of" the edge for a superior burr-free edge that cuts effortlessly. Separate honing stage polishes the edge for flawless performance. The sharpens all quality knives including straight edge household and kitchen knives, Santoku, sports and pocket knives, as well as serrated knives. Engineered and assembled in the U.S.A. 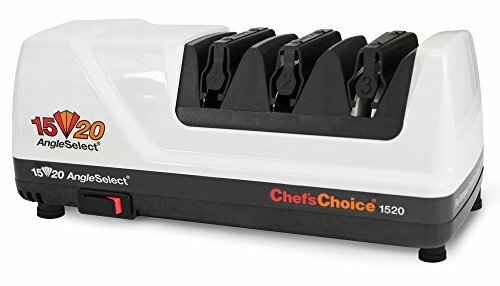 Chef's Choice 463 pronto manual asian/santoku sharpener is the fastest manual sharpener on the market. The 463 includes two stages, one for sharpening and a second for honing/polishing for a razor-sharp, arch- shaped edge that is strong and durable. 100-Percent diamond abrasives are used in both stages 1 and 2, and the diamond abrasive wheels will hold its shape indefinitely, (unlike ceramic wheels which lose shape over time). The criss-cross sharpening technology creates an extremely sharp edge with lots of bite the diamond abrasive wheels sharpen simultaneously into and out-of edge for a superior burr-free edge. Micron size diamond abrasives in stage 2 leave your knife with a super sharp polished edge. The precise bevel angle control sharpens to an ultra sharp asian-style 15-degree edge. The pronto is safe to use on straight edge and serrated santoku, and other double bevel asian style knives. It incorporates conical 100% diamond coated disks in Stages 1 and 2 and a revolutionary stropping/polishing disk in Stage 3. In just seconds, an edge of unprecedented sharpness and durability is obtained on fine edge (straight edge) and serrated knives. The flawless, highly polished fine edge can be customized to suit the cutting task. High precision elastomeric angle guides eliminate all guesswork. 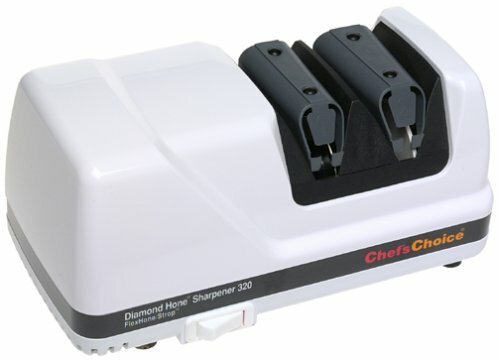 Chef's Choice Angle Select Diamond Hone Knife Sharpener No.4633 can be used for Euro-American/Satoku/Serrated knives. 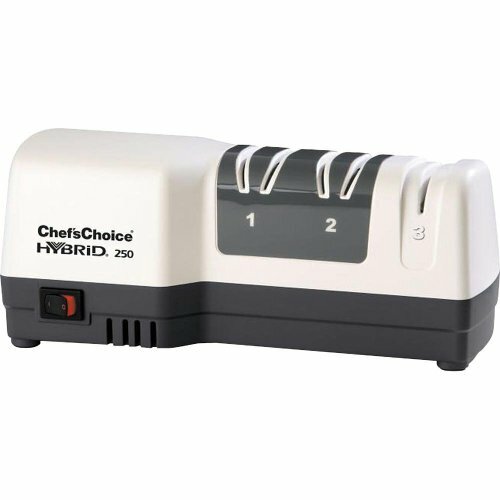 Elegantly-styled with a compact footprint, this professional manual 3-Stage sharpener applies a super sharp edge on all quality knives including straight edge kitchen and household knives, Santoku knives, sports and pocket knives and serrated knives. It will quickly and easily restore the traditional 20 degree edge on European and American style knives and a 15 degree edge for Asian style knives. Using 100-percent diamond abrasives, precise angle control and an advanced sharpening system, it creates a super sharp, double beveled edge that is stronger and more durable. The Angle Select M4633 sharpens the entire blade length, from tip to bolster, with no guesswork. Featuring an ergonomic handle to fit all hands, it can be used right or left-handed. The slip resistant rubber feet hold fast to the work surface. Engineered and assembled in the U.S.A.
3-stage sharpening and our advanced hybrid technology are combined in this compact, easy to use sharpener that features both electric and manual stages and 100-percent diamond abrasives to quickly apply a super sharp, arch shaped edge. Ideal for all quality knives including fine edge and serrated, kitchen and household as well as sports and pocket knives, the m250 creates a triple bevel edge using three successive stages. The first and second stages are electric and use 100-percent diamond abrasives for shaping and sharpening the first two edge bevels. Stage 3 hones and polishes the third bevel using ultra-fine diamonds for a razor sharp, arch-shaped, professional edge that is stronger and more durable than conventional v-shaped or hollow ground edges. Since it is the manual stage, stage 3 can be used anytime and anywhere without power. It also sharpens serrated edges. One year limited warranty. Engineered and assembled in the u.s.a. 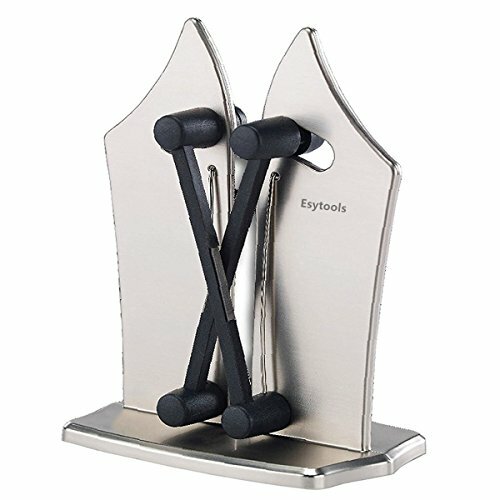 This sharpener both hones and sharpens your knives on both sides of the blade. Each pass through the sharpener grinds both sides of the blade for quick results. 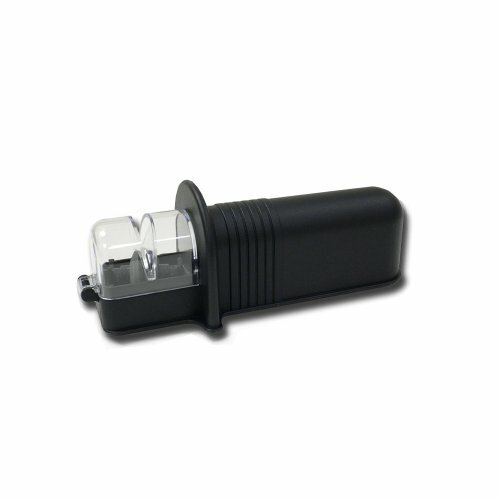 This device can also be used on small knives and is fully mechanical resulting in no need for batteries or electricity. It can also be used on serrated edges. Be sure to use only on one brand type as it can cause improper sharpening. 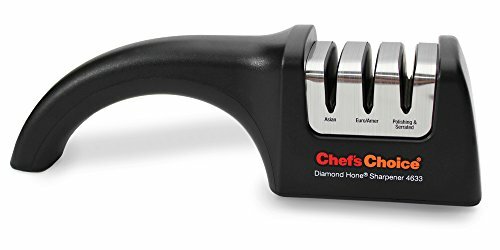 Chef's Choice Diamond Hone Angle Select Model 1520 is the world's most versatile sharpener designed to sharpen Asian, European and American style knives. It is engineered to provide astonishingly sharp edges using highly precise knife guides that automatically position the knife. 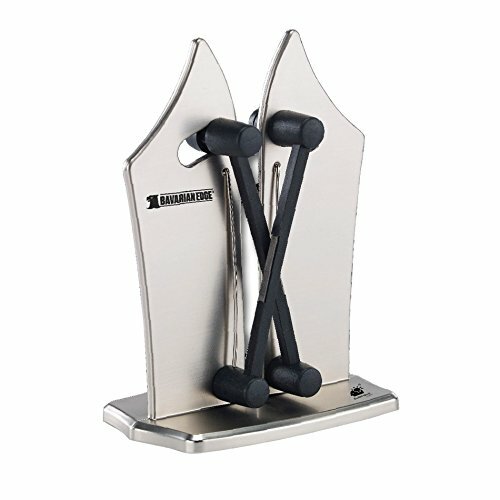 The multi-stage sharpening system features 100% diamond abrasives and patented flexible stropping polishing discs that create a gothic arch edge structure recognized for incredible sharpness and durability. 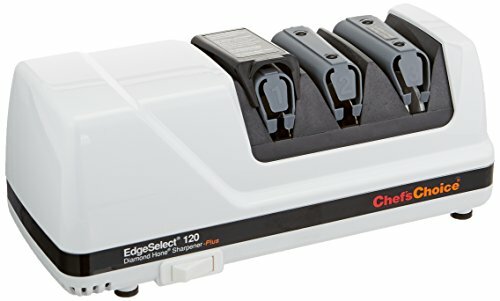 This advanced electric sharpener can restore and recreate both a 20 degree edge for European and American style knives and a 15 degree edge for Asian style knives. It will quickly sharpen fine edge or serrated blades; Santuko and traditional Japanese style single bevel edges including thicker Deba style blades; as well as sports knives, pocket knives and serrated edges.